As a business owner, one of the primary things that you have to do constantly is customer education. This industry is filled with esoteric terms, too many choices, and potential landmines that can shift an easy order to a disaster if you are not careful. Yet, many shops often blame the customer first, instead of looking inward at their own processes and effort to funnel them into the correct behavior that makes everything easier for everybody. In this article, my goal is to outline three easy to implement tips that can help your shop quickly educate your customer, increase your sales, and drive more profit to the bottom line. One of the key points in Stephen Covey’s famous “Seven Habits of Highly Effective People” is “Seek first to understand, then be understood”. Well, for starters aligning your company with your customer’s needs means you first have to listen to them. You can yell from the mountaintops all day long about how great your company is, but if that doesn’t parallel with what your customers actually want you won’t get much traction in the marketplace. This is why businesses that don’t listen very well to their customers drop their pants on pricing at the first chance they get. When you have nothing valuable to say then the price is the main theme to your business argument. There simply isn’t a connection. This is why you have to do the work and drive for clarity. What is your customer’s biggest pain point? Is there something that you do that can solve that problem easily? Sharpen up your active listening skills and talk to your customers. (or potential customers) Find out what really matters to them. I know what you are saying. “Oh, come on Marshall, does this really even work?” You bet. And here’s why. You can increase the number of qualified leads for business. Stop talking to the wrong people. Closing sales and customer support become easier, as you will understand your customer’s better. You will have more satisfied customers because they will be in alignment with what you do for them. Customers will value what you offer, so you can sell at a higher and more profitable level. Your business and marketing plans become easier to tweak. The roadmap for the future success becomes smoother. The mark of a professional is being ready. Virtually any answer is at your fingertips. The same holds true in the decorated apparel industry. Our customers want answers. They need help and guidance. To them, you are the fountain of knowledge. But when you fumble around and send things to them that look hacked together, the trust that you should be building doesn’t develop. You have to make it easy for people to do the right thing. Often, I see posts online from shops complaining about how a customer “sent in this trash art” or “texted me at 2:34 am for a quote” or “wanted thirteen designs printed for fourteen shirts”. What’s obvious is that the shops posting these frustrating tidbits aren’t doing a good job of educating their customers regarding how their business operates. When you have that information spelled out on your website, or handy to send to the customer, you can funnel their behavior into how you want them to operate. You have to spell out your process and make it easy for people to do the right thing. Otherwise, they invent their own path to your doorstep. For example, let’s compare with what happens when you go see a doctor. When you come in, there is a process that happens. You have to present your insurance card and payment. There’s that clipboard with the forms you have to fill out. You get to lounge on a hopefully disinfected vinyl covered chair and read last year’s Sports Illustrated while you wait for your name to be called. Nobody simply walks back and says, “Hey Doc, can you look at this? Whaddya think? They have a process that is defined. It’s the same in restaurants, an automobile tire store, even ordering from Amazon. A process keeps things simpler. So if you don’t want to receive a Word document as art, build your branded shop “Art Guidelines” that spells out exactly what you need. What are the correct file formats? Explain the difference between a raster and a vector file. Talk about stock ink colors and Pantone colors. Illustrate the difference between an applique embroidery and puff embroidery. Get that into a .pdf document. Make sure you can send it over from your phone. Have it downloadable from your website. Be proactive and send it before your customer starts noodling around with the art file. The same goes for those text messages. Personally, I don’t understand the problem. For your customer, this could be their preferred method of communication. It’s becoming the norm. Instead of fighting it, build an auto-responder for after-hours texts. Determine how you can channel this into an order and be ready. Believe it or not, there are shops out there now that are sending art approvals and quotes to customers via text because they know that these have a faster and higher open rate than emails. And that guy that wants, “thirteen designs on fourteen shirts?” Good thing you have that online design tool and DTG printer. Build the solution for what your customers are asking for. Building content is difficult. It’s a commitment. I’ve been publishing this blog every Saturday for eight years now. That has certainly led to many opportunities that I wouldn’t have had if I had never started. Looking back, those first articles weren’t very good and it was a challenge to put them together. I have a process and its almost a no-brainer. That’s what putting in the time and making the effort can do. For educating your customers, content is king. We live in a search-word driven world. Everything is online. When you are not posting something, you might as well be irrelevant. But what you post is important. It’s how you will be judged and weighed by your audience. Content isn’t restricted to blog articles either. You can create videos, take pictures or start your own podcast. The important thing is that you are sharing information and that you put your customer base first. What do they want to see or learn about? For example, take the top ten things people constantly ask you. Schedule some time and create a content piece for each of these. Hit publish. Get it on your website. Post it on your social media. Earlier in the article, I outlined the need for developing a process to make things easier. One thing you could do is to illustrate that process with a content piece. For example, maybe you print on a lot of hoodies. By all accounts, you are the hoodie expert. Which one do you have the best results with and why? What should the art look like? Create an educational piece that outlines your thoughts on that. Then, when a potential customer asks about hoodies you have something awesome to show them. This can also have a great result in steering your customer into the apparel blank that you like to decorate the best. Whether it is because your margin is higher, or it’s easier work that’s for you to decide. The point is that customer education is what drives your shop to be sticky with potential sales. Do you have any Sales and Marketing challenges? I’ll bet you do. Part of the Shirt Lab ecosphere is the Shirt Lab Answer Series podcast. Guests answer listener supplied (that means you) questions on a variety of topics. Episodes are only 10-15 minutes in length, so they are perfect for that morning commute. Got a question for us? We’d love to get your biggest sales and marketing challenge worked into a future show. Shoot me an email at marshall@shirtlabpro.com! 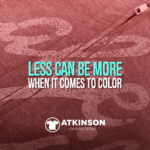 Less Can Be More When It Comes to Color Are You Busy Being Busy Or Busy Being Profitable?